Introduction: Recently some studies suggested that sentinel node biopsy (SNB) can be also applied to gastric cancer. 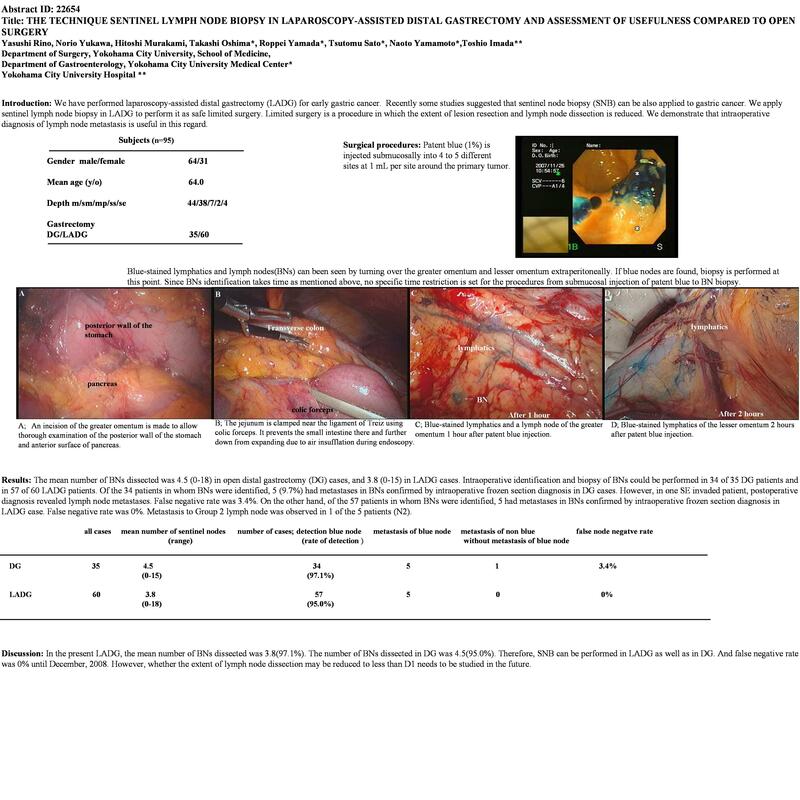 We apply sentinel lymph node biopsy in laparoscopy-assisted distal gastrectomy (LADG) to perform it as safe limited surgery. Limited surgery is a procedure in which the extent of lesion resection and lymph node dissection is reduced. We demonstrate that intraoperative diagnosis of lymph node metastasis is useful in this regard. Surgical procedures: Patent blue (1%) is injected submucosally into 4 to 5 different sites at 1 mL per site around the primary tumor. Blue-stained lymphatics and lymph nodes(BNs) can been seen by turning over the greater omentum and lesser omentum extraperitoneally. If blue nodes are found, biopsy is performed at this point. Since BNs identification takes time as mentioned above, no specific time restriction is set for the procedures from submucosal injection of patent blue to BN biopsy. Subjects@and@methods: SNB has been performed in our institution since November 1999. The study was conducted in 95 gastric cancer patients with a preoperative diagnosis of T1 or mp invasion. Informed consent was obtained from the all patients. There were 64 males and 31 females with a mean age of 64.0 years. Tumor invasion of m, sm, mp, ss, and se was identified in 44, 38, 7, 2, and 4 patients, respectively. All patients underwent open distal gastrectomy (DG) or LADG and Billroth-I reconstruction. Results: The mean number of BNs dissected was 4.5 (0-18) in DG cases, and 3.8 (0-15) in LADG cases. Intraoperative identification and biopsy of BNs could be performed in 34 of 35 DG patients and in 57 of 60 LADG patients. Of the 34 patients in whom BNs were identified, 5 (9.7%) had metastases in BNs confirmed by intraoperative frozen section diagnosis in DG cases. However, in one SE invaded patient, postoperative diagnosis revealed lymph node metastases. False negative rate was 3.4%. On the other hand, of the 57 patients in whom BNs were identified, 5 had metastases in BNs confirmed by intraoperative frozen section diagnosis in LADG case. False negative rate was 0%. Metastasis to Group 2 lymph node was observed in 1 of the 5 patients (N2). Discussion: In the present LADG, the mean number of BNs dissected was 3.8(97.1%). The number of BNs dissected in DG was 4.5(95.0%). Therefore, SNB can be performed in LADG as well as in DG. However, whether the extent of lymph node dissection may be reduced to less than D1 needs to be studied in the future.